Despite the US Centers for Disease Control and Prevention (CDC) repeated statements that the Ebola virus cannot be transmitted in the air, two University of Illinois professors warn that the virus could spread that way. The researchers focus on recommendations for protective gear, but their work raises questions about CDC reassurances that extremely close contact with an infected patient is the only way Ebola is spread. The authors teach at the School of Public Health’s division of environmental and occupational health sciences, at the University of Illinois at Chicago. The belief that the Ebola virus cannot spread through the air is based on research done in the 1950s when scientists did not have the capability to detect and measure small particles near an infected person and thus were unable to learn whether such particles could carry pathogens, they wrote. But it is these small particles that can be easily inhaled, not the larger droplets that are the focus of some currently used personal protection equipment, Brousseau and Jones wrote. 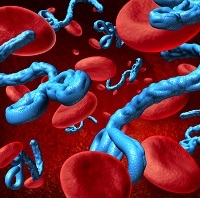 Ebola viruses appear to be capable of initiating infection in a variety of human cell types, “but the primary portal or portals of entry into susceptible hosts have not been identified,” they wrote. Ebola is less specific than the flu or HIV in which cells it uses as entry points. The virus interferes with macrophages and dendritic cells, the immune response cells located in epithelial tissues throughout the body, including the respiratory tract. Ebola stops these immune system cells from their usual antiviral activities but not their ability to trigger an inflammatory response—resulting in some of the disease’s symptoms. Since they could reach the epithelial cells in the respiratory tract through inhalation, focusing prevention efforts simply on contact with body fluids is not enough, they wrote. “The chance of large droplets reaching the facial mucous membranes is quite small,” they wrote, but smaller particles are also dangerous, they said. They also wrote that these particles could spread farther than the existing estimate of 3 ft. away from a patient. The researchers said when they began their study of the possibility that Ebola could spread through aerosol transmission, they were skeptical. But a review of existing studies convinced them that “Ebola and other filoviruses may be opportunistic with respect to aerosol transmission.” Other routes of entry may be more efficient for the virus, but inhalation infection cannot be ruled out. They found the virus can live in the air for up to 90 minutes. Such aerosolized transmissions could come from coughing, sneezing, vomiting, and toilet flushing, the duo wrote. Their conclusions suggest that decisions about which facemasks, hoods, or respirators health workers should use are critical. “Facemasks do not offer protection against inhalation of small infection aerosols,” they wrote. As for respirators, an air purifying half-face piece respirators such as an N95 air-filtering (negative pressure) face piece respirator should be “the minimum level of protection” used, they said. A powered full-face piece air-purifying (negative pressure) respirator or a half-face piece positive pressure respirator is better and should be worn in highest-risk situations, such as workers tending to patients in West Africa.